Freefoam has announced the Spring edition of their Product Catalogue. With an updated look and new products, the guide is said to provide customers and users with the complete guide to the full range of Freefoam products including PVC-U and PVC-UE fascia, soffit, rainwater systems, exterior cladding, interior panelling and flooring. With over 2000 product items, a clear and concise catalogue is said to be essential for Freefoam stockists to promote the range. This A5 compact format is reportedly ideal for building professionals, roofline fitters and roofers to keep a copy handy whilst on the go, with all the product information they need. The Spring version features a more contemporary cover featuring the popular anthracite grey fascia and a stronger focus throughout on the colour roofline range. A major feature of the catalogue is the inclusion of all colours for each product, allowing users to clearly see the extensive range of options available. A fold out sheet also shows high resolution images of each colour allowing colour matching to other products such as windows and doors. Additions to the Spring catalogue include the new ‘Klicker’ Flooring range and pages to highlight handy online tools such as Freefoam’s colour roofline visualiser and cladding calculator. 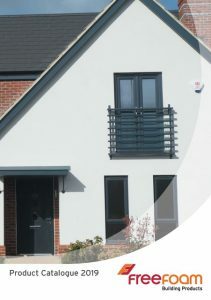 Installers also benefit from the inclusion of fitting instructions for the roofline and cladding ranges.